I have always loved nature. It's where I'm most at peace. For 10 amazing and intense years, I had the privilege of sharing my love for wild places with youth and families struggling to find their way in mainstream culture. We kayaked, hiked, spoke our truth at Council Fire, and formed uncommon bonds that to this day remain a source of inspiration. The place we did this work is called Ravenwood. It is a healing forest. In 2010, I was diagnosed with multiple myeloma, a rare and incurable plasma cell cancer. I needed a stem cell transplant and a radical change of lifestyle. Along with a good medical team and a strong and loving circle of people supporting me, Ravenwood saved my life. 8 years later, I'm still here. Ravenwood is now home to my family. Although I can no longer do the physical work of a wilderness guide, it remains my calling to share the healing powers of nature. I still call myself a guide but the places I now navigate and explore are the wild terrains that live within the human soul. Nature is my co-guide. I work with the natural world to help make sense of inner emotions and life experiences. I believe that spending time in nature fosters awareness and interconnection to the world around us, providing the space for inward reflection and the potential for transformation. How we encounter and interpret the natural world creates a personal narrative that gives meaning to experiences and emotions allowing us to develop new ways of understanding ourselves and feeling fully integrated in our lives. Through connection with the natural world, we ultimately become connected to our ‘inner’ nature. Personal distress can be alleviated by developing the mutual connection between inside and outside. 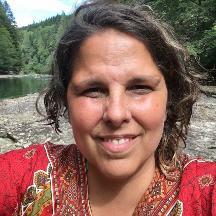 I work with a range of practices including mindfulness and awareness, experiential activities, direct contact with nature, narrative therapy, environmental action, journaling, ritual, ceremony, and play. As a Métis woman, I weave cultural teachings into my work, inspiring personal growth and a love and respect for the natural world. Academically, I hold a Bachelor's in education, from McGill University and a Master’s of Arts in transpersonal psychology with a concentration in ecopsychology, from Naropa University. I have also completed masters level clinical counselling courses in counselling theory, family systems therapy, group therapy, and research methods, and have trained with the Vancouver School of Narrative Therapy. I am a recognized facilitator of Joanna Macy's Work That Reconnects, and a Level 3 Reiki Usui Practitioner.